as far I understand horizontal lithoblending it assign know value to all unknow value in a horizontal circle until doesnt come to another know value. 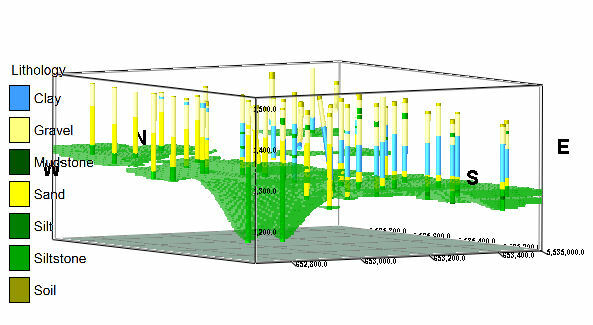 In RockWorks14 it's the same process, but less automatic - you'll need to create the borehole base surface manually, typically by transferring the location data to the Utilities datasheet, subtracting TD from Elevations to determine the elevation at the base of the holes, and creating a grid surface using Map | Grid-Based Map. Then specify that grid model as the Lower Surface (Grid) Filter GRD file. I think the easiest way to constrain the model horizontally is to define a polygon outside of which the nodes are set to null. To define the polygon in RW15, you can create a borehole location map, and use the RockPlot2D Draw | Line Types | Polygon to draw a polygon representing your area of confidence (double-click to close the polygon). Then click the Edit arrow tool, right-click on the polygon, and select Save to Polygon Table, and assign the table a name. This will be saved to your project database. Then, you can use that polygon as a Spatial Filter when creating a new lithology model, or you can filter an existing model with the polygon using the Utilities Solid | Filter | Polygon Clip tool. Another option is to interpolate the lithology using the Closest Point algorithm, for which you can activate a Distance Cutoff Filter. Just define the distance from any hole beyond which you don't want the material type to be interpolated.